When Zach Britton was acquired from the Orioles in late July, he was viewed largely as a luxury to an already loaded Yankees bullpen. However, as the regular season winds down, and the calendar flips to October, Britton has become much more than that. In fact, at this critical point of the season, the 30-year-old lefty has established himself as the team’s most trustworthy reliever. This development is somewhat hard to believe considering the inauspicious start that Britton’s New York career got off to, but here we are. In nine September appearances, Britton has yet to allow a run across 8.2 innings. During that span, the two-time all-star has struck out nine batters and allowed only four base runners (0.46 WHIP). The biggest development for Britton is his elimination of free passes. Over his first 6.1 innings as a Yankee, Britton walked six batters. He had a 7.38 ERA in that time. In the ensuing 17.2 innings, only two batters have reached first on four balls. Over the course of those 17 games, the 6’3 left-hander has an ERA of 1.57. Cutting down on walks has directly correlated with Britton’s resurgence. And during the same stretch, some of the Yankees’ other relief aces haven’t been at their best. De facto closer Aroldis Chapman is still working his way back from a knee injury that cost him nearly a month. Since being activated on September 19, Chapman has a 7.36 ERA in 3.2 innings (four games), but has looked better each time out. 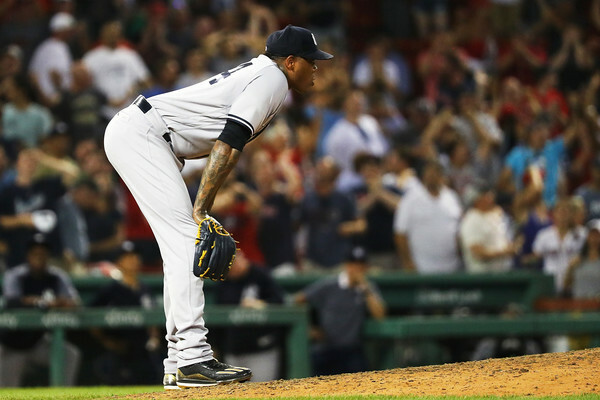 With that being said, it’s also important to remember that Chapman has allowed 14 runs in 17 innings (7.41 ERA) against the Yankees’ possible ALDS opponent, the Boston Red Sox, this season. Eventually, Chapman may regain his standing as the team’s top high-leverage reliever, but it’s Britton for now. Moving on, Dellin Betances might be the best reliever in the league when he’s on, like he was in June and July (0.41 ERA), but he has been slightly off since then. While he hasn’t been bad in August and September (3.12 ERA), the drop-off has been noticeable. Betances has allowed more hits in September (nine) than he did in June and July combined (eight). Moreover, Betances has blown three late-inning leads since August 30, and simply can’t be relied on to protect a one-run lead currently. Finally, we look at David Robertson, who, after a stellar stretch from the beginning of August to mid-September (14.2 scoreless innings), has surrendered six runs in his last seven innings (7.71 ERA). Robertson has struggled with home runs all year, tying a career-high with seven big flies allowed. The Yankees will face an Oakland Athletics team that has hit the third-most home runs in MLB in the do-or-die Wild Card game. Putting David Robertson into a tight, late-inning situation against the likes of Khris Davis (47 HR), Matt Olson (29 HR) and Matt Chapman (24 HR) seems less than wise. One thing I want to make clear is that this is not an article stressing that Zach Britton should the team’s “closer.” When a team has as many dynamic bullpen arms as the Yankees do, there is no need to have set roles. Instead, the argument here is that Britton should be used in the most high-leverage situations in the postseason. Whether that comes in the third, fifth or ninth inning doesn’t really matter. The Yankees have an embarrassment of riches in their ‘pen, and Zach Britton is the gold standard out there right now.